SEOUL: North Korean leader Kim Jong Un plans to invite experts and journalists from the United States and South Korea when the country closes its nuclear test site in May, Seoul officials said yesterday, as US President Trump pressed for total denuclearization ahead of his own unprecedented meeting with Kim. On Friday, Kim and South Korean President Moon Jae-in vowed “complete denuclearization” of the Korean peninsula in the first inter-Korean summit in more than a decade, but the declaration did not include concrete steps to reach that goal. North Korea’s state media had said before the summit that Pyongyang would immediately suspend nuclear and missile tests, scrap its nuclear test site and instead pursue economic growth and peace. Kim told Moon that he would soon invite the experts and journalists to “open to the international community” the dismantling of the facilities, the Blue House said. “The United States, though inherently hostile to North Korea, will get to know once our talk begins that I am not the kind of person who will use nuclear weapons against the South or the United States across the Pacific,” Moon’s press secretary Yoon Young-chan quoted Kim as saying. “There is no reason for us to possess nuclear weapons while suffering difficulties if mutual trust with the United States is built through frequent meetings from now on, and an end to the war and non-aggression are promised.” Kim said there were two additional, larger tunnels that remain “in a very good condition” at the Punggye-ri test site beyond the existing one, which experts have said had collapsed after repeated explosions, rendering much of the site useless. Kim’s promise shows his willingness to “preemptively and actively” respond to inspection efforts to be made as part of the denuclearization process, Yoon said. To facilitate future cross-border cooperation, Kim pledged to scrap the unique time zone Pyongyang created in 2015. He said the North would move its clocks forward 30 minutes to be in sync with the South, nine hours ahead of Greenwich Mean Time. Kim also reaffirmed that he would not use military force against the South and raised the need for an institutional mechanism to prevent unintended escalations, Yoon said. Late Saturday, US President Donald Trump told Moon in a phone call that he was pleased the leaders of the two Koreas reaffirmed the goal of complete denuclearization during their summit, Seoul officials said yesterday. Moon and Trump agreed on the need for an early summit between Trump and Kim, and explored two to three potential locations, one of which Moon suggested, the Blue House said. The candidates for the venue did not include North Korea, the United States or the demilitarized zone dividing the two Koreas, a Blue House official told reporters, declining to elaborate. A senior US official has said Singapore is being considered as a possible venue for the Trump-Kim summit. “Trump said it was good news for not only the two Koreas but the whole world that they affirmed the goal of realizing a nuclear-free Korean peninsula through a complete denuclearization,” Blue House spokesman Kim Eui-kyeom told a separate briefing. “Moon told Trump that Kim said he and Trump would get along with each other, … and Trump said he was looking forward to talks with Kim and there would be a very good result.” Trump, who called the 75-minute chat “a long and very good talk” on Twitter, said his summit with Kim would take place sometime in the next three to four weeks. “It’s going be a very important meeting, the denuclearization of the Korean peninsula,” he said at a campaign rally in Washington, Michigan, on Saturday. The White House said Trump and Moon during the call “emphasized that a peaceful and prosperous future for North Korea is contingent upon its complete, verifiable, and irreversible denuclearization.” Most of the specific commitments outlined in the official declaration signed by Kim and Moon focused on inter-Korean relations and did not clear up the question of whether Pyongyang is willing to give up its arsenal of nuclear weapons and ballistic missiles. Abe’s office said yesterday that Trump and Abe highlighted the significance of Pyongyang’s taking concrete steps towards denuclearization in their phone call. Trump had informed Japanese Prime Minister Shinzo Abe that he would urge North Korea to promptly resolve its abductions of Japanese citizens, the White House said. 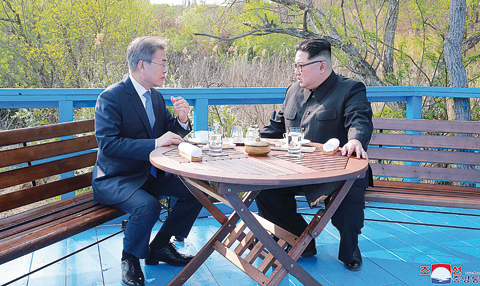 Moon also had a phone call with Abe yesterday and said he had discussed the abduction issue with Kim during the summit “in substantial detail,” the Blue House spokesman said. Pyongyang admitted in 2002 to kidnapping 13 Japanese in the 1970s and 1980s to train spies. Five of them returned to Japan, but Tokyo suspects that hundreds more may have been taken.